"The Only One Who Can Stop A Serial Killer is The Man Who Inspired Him! New Poster for 'THE RAVEN'! A new poster has been released for James McTeigue's [V For Vendetta] upcoming thriller The Raven via EW. The movie is a fictionalized account of the mysterious final five days of American writer Edgar Allan Poe's life. 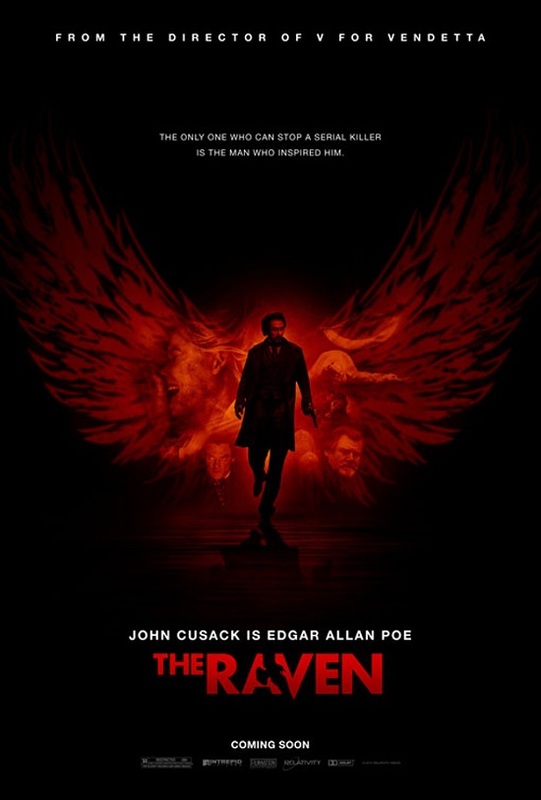 The story follows the renowned writer [John Cusack] as he teams up with a Baltimore detective [Luke Evans] to search for a serial killer whose murders are inspired by Poe's own work. The movie also stars Brendan Gleeson, Alice Eve, Oliver Jackson-Cohen & hits theaters April 27th release. I'm reading: "The Only One Who Can Stop A Serial Killer is The Man Who Inspired Him! New Poster for 'THE RAVEN'!Tweet this!